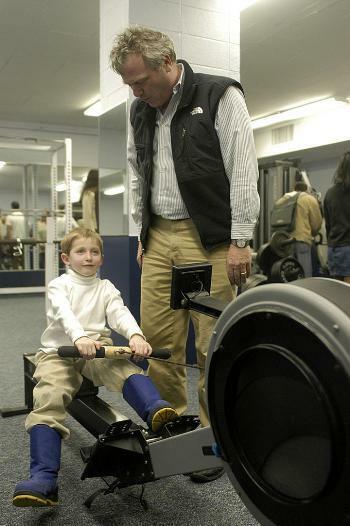 Quincy House Master Robert P. Kirshner watches as Tom Parker, the six-year-old son of Kennedy School Professor Richard Parker, tries out one of the new rowing machines in the Quincy House gym. With their House gym now in good shape, Quincy residents are ready to pump up. After a month-long renovation largely financed by a $20,000 grant from the College, Quincy House reopened its gym yesterday, setting the course for the proposed renovation of all House gyms. To compensate for the delayed reconstruction of the Malkin Athletic Center (MAC), the College decided last November to grant the Houses $20,000 each to upgrade their gyms. University Hall officials are still considering a variety of plans to ease the space crunch in the MAC and have not committed to if or when the project will begin. Quincy House elected to spend its grant to purchase a new elliptical machine, stationary bicycle, treadmill and universal weight machine. The gym, rewired to accommodate the increased electrical demands of the new equipment, also boasts new blue carpeting and freshly painted walls. Quincy will receive an additional $1,300 from the Undergraduate Council to defray the cost of the facelift. Quincy House Co-Master Jayne Loader said that she pledged to match council funding with House money in order to supply the medicine balls, workout mats, and smaller weights that she said Quincy residents have requested. She has lent her personal weight set to the Quincy gym until new equipment arrives. “Our theory is the better the gym looks, the more people will take care of it,” said Quincy House Co-Master Robert P. Kirshner. “An inert body without a gym becomes spherical,” Kirshner wrote in an e-mail Tuesday night. After cutting the ribbon, Kirshner immediately climbed onto one of the new elliptical machines. “We move from a state of flabbiness to a state of being pumped up,” he told students. Discussions about renovating the Quincy gym began about a year ago, when the House’s lone treadmill malfunctioned. When Caroline A. Gross ’05 brought the problem to the Masters’ attention, they were eager to help because they were fitness buffs and wanted to promote student fitness, Gross said. The two Masters, Gross and Quincy House Committee member Sean N. Karamchandani ’05 formed a committee to investigate the cost of purchasing a new treadmill.